Senses Working Overtime is an exposition where the audience becomes the performer. Your role as an active participant is essential; merely looking and listening no longer suffices. As the audience you are immersed in a sensory experience or you act in an interactive installation in which you initiate and manipulate the performance yourself. By creating an experience, by letting you smell, taste and feel, your ratio is ignored and your subconscious is activated directly. You are the performer and the spectacle, all at the same time. Young artists and creators from various disciplines integrate new technologies with elements from the performing arts. We challenge you to surrender yourself to this cabinet of performative installations and sensory performances! Click on the Read More button for more information on every installation or download the time table. Admission to the Senses Working Overtime exhibition costs €10 and for that you can visit the exhibition and all the installations throughout the day. Because of the limited capacity of the installations, you should, on the day itself, at the box office in Het Huis, reserve a place for Alice and Zvov Sensory. For Tasteful Turntable you can buy a single ticket at the door for €7,50, or you can book the combined Admission + Tasteful Turntable ticket online for €17,50. Click on the ‘order tickets’ button for the admission as well as and the combination ticket. That way you are immediately guaranteed a place! Sensory Showers, Panauditum, Resonate, Fluid Resonance and Oscillation can be viewed continuously. Please Note: The ticket sales for Senses Working Overtime as indicated in the programme book is incorrect. We are sorry for any inconvenience this may cost. ALICE is a performance installation, inspired by L. Carroll’s book Through the Looking-Glass, and What Alice Found There, in which you yourself are both observer and performer. Together with a small group of ‘spect-actors’, you find yourself in a transreal environment where the physical and virtual worlds gaze at each other. What is real in this world that holds a mirror up to your face? Did you dream the same dream as others did? ALICE was developed by I/O’s artistic team: Thanasis Deligiannis – artistic direction and composition, Roelof Pothuis – set and light design, David Jonas – creative coding. Thanasis Deligiannis is also artist in residence at Gaudeamus. How is our perception of the taste of food influenced by sound? This question was the starting point for Tasteful Turntable. The two Danish composers and brothers Lars and Nikolaj Kynde created together with chef Mette Martinussen twenty-four small dishes arranged on a rotating table. While tasting the dishes, each guest hears via headphones a synchronized soundtrack that is attuned to the taste of each dish. Every sound is composed with the utmost precision, bite for bite. Bon appétit! In Sensory Showers light designer Vinny Jones and sound designer Felipe Ignacio create immersive spaces, within which it is possible to create specific compositions of sounds, light and smell. These compositions trigger associative memories with the audience. In this way Sensory Showers is linked to computer- or video games which gives an exciting look at the possibilities of semi-narrative experience in a live setting. Blindfolded, you are led by the hand into the performance area. Once in the soundproofed space, you hear the sound of stringed instruments moving around you. With the help of various prepared objects, Zvov’s musicians wander around the audience introducing each individual to stimuli designed to create a new and exciting experience. Every sound, touch and smell is magnified in this personal, intimate, and sightless voyage of discovery. Panauditum is a installation based on the role of sound in our modern surveillance society. We are very aware of the value and strength of our appearance and image but less aware of how valuable and personal the sound we produce is. Panauditum, a resonating wall-mounted sculpture consisting of nine planes, works with the unconsciously distributed sounds by visitors to the exhibition Senses Working Overtime, building an evolving composition of speech combined with pre-recorded electromagnetic artefacts of communication devices. Fluid Resonance, designed by sound artist Ricky van Broekhoven, is an interactive audio-visual musical instrument which employs sound energy to generate wave patterns in water. You play the instrument by moving your hands around in the water, which creates interferences in the electromagnetic field. These interferences, or wave movements, determine the frequency (pitch) and amplitude (volume) of the sound. The slightest movement becomes audible and visible. Resonate is a custom-built suit, designed in collaboration with fashion collective Das Leben am Haverkamp, that enables you to experience music in an entirely new way. Resonate turns music into a sophisticated, physical full-body experience, as a set of ten custom-made transducers (a kind of speaker) transmits a full range of sound directly onto the body. Experience this unique combination of music with a composition of vibrations. In 2013 Pépé Heijenberg experienced a burn-out. Based on this experience he found it important to start a conversation about this mental illness. The goal of Oscillation is not to let you feel what a burn-out is, but to show you the world of rhythm which can help understand how we cope with rhythms which disturb our own. With Oscillation, Heijnberg graduated in 2017 from the Interactive Performance Design programme at the HKU University of the Arts Utrecht. 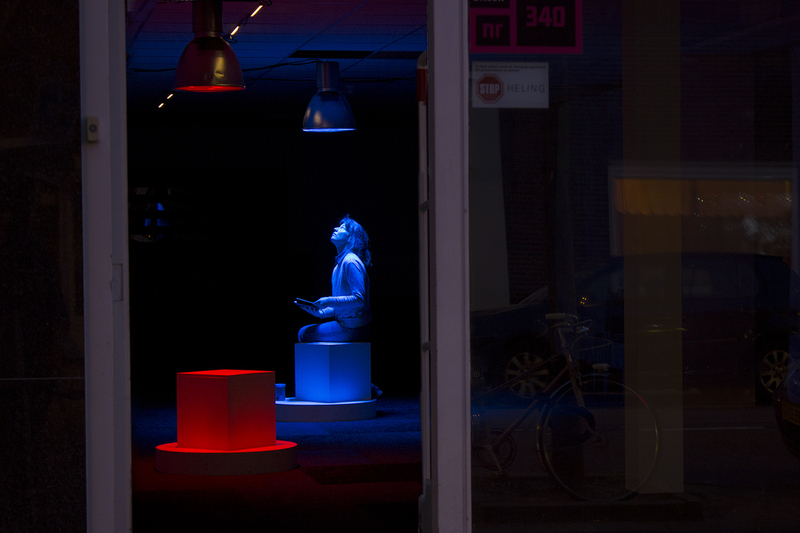 Please note that this installation is located on the corner of the Boorstraat / Amsterdamsestraatweg.